This article will cover some common RV electrical problems; however you should NOT attempt to fix any RV electrical issue, or RV appliance alone without prior knowledge of how everything works. In fact, you could cause harm or injury to yourself or the motorhome inadvertently. It’s best to hire a reputable RV repairman, and Fix My RV is the best RV technician in the area. Jeff Averyt graduated from the only RV technician school in the United States, the RV Training Center in Clearwater, Florida. The investment in your RV is something we take very seriously. It’s all about YOU, your needs, lifestyle, and having minimal disruption during the repair process. That’s why we prefer to spend ample time with you going through the details before, during and after the work has been completed. We’ll discuss what you can expect during the repair process and if there is anything that can be done to prevent a similar failure in the future. Mobile RV repair you can trust and count on! Is it bad to leave your RV plugged in all the time? Are there concerns doing this? We would like to see the situation in which the question is being asked in order to assist more. The short answer is, you are probably ‘ok’ to do this, however more information would be needed in order to help with your common RV electrical problems related to leaving the RV plugged in to run an appliance, like the refrigerator. 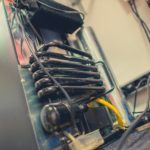 Most RVer’s use appliances like a refrigerator all the time, and in these cases, there are specific ways of ensuring it is powered all the time. Will an RV converter work without a battery? Most appliances in your RV home will not work without a 12-Volt DC house battery system. We hope that rather than troubleshooting Common RV electrical problems, you reach out to an experienced and reputable RV electrical repairman. Fix My RV repairs and troubleshoots RV electrical system issues. Have RV power failure? Call Fix My RV for mobile RV repair AZ. We come to you, at your location offering mobile RV repair services in Avondale, Buckeye, Glendale, Litchfield Park, Morristown, New River, Peoria, Phoenix, Scottsdale, Surprise, Tolleson, and Wittman. Find out more about RV electrical system repair, Aqua Hot heating systems, RV propane tank repair, RV Refrigerator Repair and RV awning repairs.